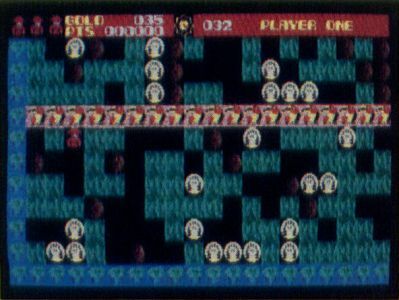 Rockford is a spin-off of the 8-bit game Boulder Dash, a game that was so popular, it became the first home computer title to be converted into a coin-op game. An unusual occurrence, to say the least. Now we have gone full circle with the home version of a coin-op conversion of a home version. Does that make sense? Since Arcadia produces its coin-op titles on a 68000-based computer, the home versions are said to be virtually identical to their arcade cousins. Even though I never personally saw the coin-op Rockford, I believe that their claim has merit, for the ST version is coin-op quality. For those of you who are not familiar with Boulder Dash or Rockford, you can think of the game as an inverse Pac-Man, in which you create tunnels through each maze by digging away at the colorful background, collecting treasures and accumulating them until you qualify for an exit from the world. At the top of the screen is a status line that shows how many treasure items are left to be collected, the time remaining before you expire, the points scored and the number of lives left. 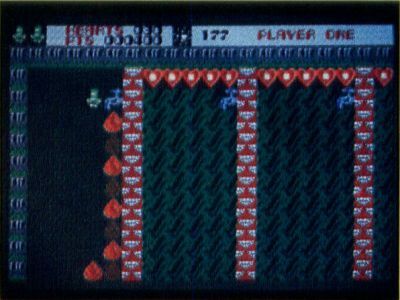 The number of collected items will decrease the counter until it reaches zero, at which time the screen will flash, and somewhere within the four-screen maze, an exit will have opened. Find the exit to escape the world, but don't run out of time or you will have to start over. Digging loosens obstacles that could trap Rockford and prevent further movement. If Rockford should find himself in this predicament, the player can elect to press the F10 key and self-destruct, which results in the loss of a life. Obstacles falling on Rockford and contact with the maze baddies yields the same result. If his timing is accurate, Rockford can push obstacles down empty shafts so that they will fall on and destroy his enemies, changing some of them to treasures that can be collected. Even though the original Rockford character, a cute bug-eyed insect, is no longer, the new Rockford is just as good. Perhaps even better, for in each new world (maze), his now human form mutates. He is a hunter, cook, cowboy, spaceman and, finally, a doctor. That's a total of five unique worlds to visit, each world containing four levels. It was disappointing to find that the high scores are not saved to disk, but since the disk cannot be copied for archival purposes, perhaps it is advisable not to try and save things to it. Saving to a separate data disk, however, would have been preferable to no save at all. The game play in Rockford differs in many respects from Boulder Dash, with Rockford now searching for gold, dollars, apples, stars and hearts. He will be chased by snakes, bats, monkeys, hamburgers, pizzas, eggs, toast, trains, wagons, tomahawks, revolvers, comets, spaceships, rockets, ears, skulls, skeletons and Frankenstein monsters. Normal walls are distinguished from magic walls by icons appropriate to the world. If it were not for the missing high-score save, Rockford would have rated an A. As it stands, a B+ is not so bad. Rockford is a magical romp you won't want to miss.